Onward! A Legacy Foundation board members and directors sign checks to 70 food banks and pantries throughout the state that were recipients of the Food Pantry Assistance Grant. From left: Board member Stephen Hanson, board President Pete Montano, Program Director Nicci Crowley and Executive Director Chuck Forth. Cortez nonprofit Onward! A Legacy Foundation has awarded $326,000 in state funding to 70 food pantries and food banks across Colorado. The money was provided through the Food Pantry Assistance Grant, an initiative by Hunger Free Colorado, which works to increase access to healthy foods for all Coloradans. Onward! served as the fiscal agent for this grant and provided 70 of the 75 grant applicants. “Onward! keeps growing,” said Chuck Forth, executive director of the nonprofit. This was the first cycle of grant distribution. Durango recipients included Manna soup kitchen, Durango Food Bank and the Garden Project of Southwestern Colorado. 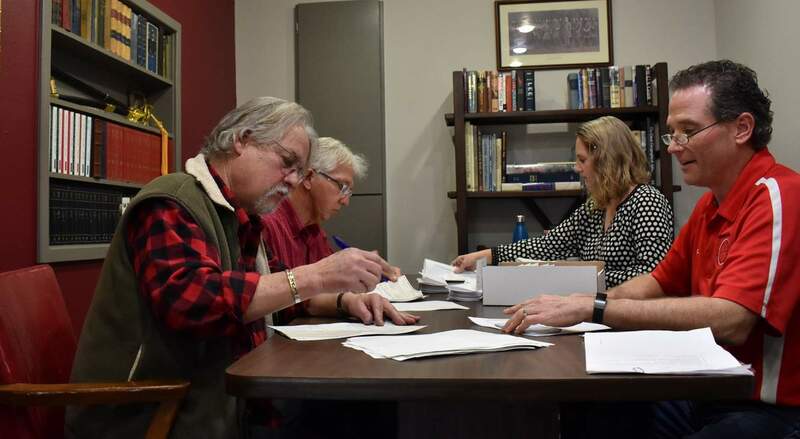 In Cortez, the Good Samaritan Center and Mancos FoodShare submitted a joint application and received a total of $6,500. Aspen Springs Food Pantry in Pagosa Springs was also a recipient. Hunger Free Colorado secured the grant money during the 2018 legislative session. It works to support food pantries, local farmers and the state economy. Grant money can be used only to purchase items identified by the Colorado Department of Agriculture as “Colorado Proud” products, although 10 percent can be used for indirect costs associated with these purchases, such as transportation, refrigeration, and storage. Onward! received 75 applications and $1.6 million in requests. There was $500,000 available. Seventy of the 75 applicants were awarded $326,000. The remaining portion money will be disbursed in the second cycle, which will open Feb. 1 to eligible food pantries and banks. For more information, visit www.onwardfoundation.org.